YO YALL WE ARE SOLD OUT OF THE U.S. GIRLS ISLAND SONG 7". WE HAVE A FEW SLEEVELESS COPIES OF THE TWIG 7" HANGING AROUND BUT THAT IS ALL. WE WILL BE UNABLE TO FULFILL ANY TWOFER ORDERS INDICATED BELOW! APOLOGIES! IF YOU WANT A TWIG 7" WE CAN CUT YOU A DEAL, BEING AS WE ARE DOWN TO THESE SLEEVELESS DREGGS. HOLLER. Lead single off Meg Remy's 'U.S. 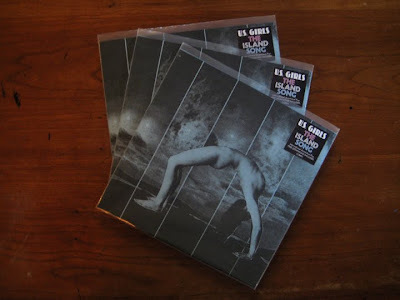 Girls on Kraak' LP released on Belgian label Kraak. The A Side is a straight hit single with heavy Italo-Disco undertones, could easily slide between Julee Cruise songs on a Lynch soundtrack. The B Side, produced by Onakabazien is an incantation to the ghost of Mariah's 1990's. LTD to 300. Includes free download. First release featuring the newly minted Slim Twig full band. Psychedelic Art-Pop conjuring an alternative reality where the Mael brothers took a wrong turn and relocated to Germany instead of England to ghostwrite for Krautrock bands. LTD to 300. Includes free download. Save cash money by ordering both discs at the same time. Download these singles digitally at our Bandcamp. IF YOU ARE EXPERIENCING PROBLEMS WITH THE PAY PAL BUY NOW BUTTON, PLEASE PAY PAL CALICO.CORPORATION@GMAIL.COM DIRECTLY WITH A NOTE REGARDING YOUR ORDER. International customers, you will receive an email if any discrepancies in shipping costs come to light. WILL REPAIR PROPER PAY PAL LINK ONCE WE RETURN FROM TOUR!! Is there a CD version on these two albums? I do not own a record player and they aren't on itunes... Please let me know, I really want these in my music collection. Is it still possible to get a There's A Secret To Your Pleasure 7" ?